When it comes to messengers, for most of us the first priority will be WhatsApp. The Reason behind this is very obvious it’s easy to use. But what if I say that telegram is much better option than WhatsApp. You must be thinking that I have lost my mind right? 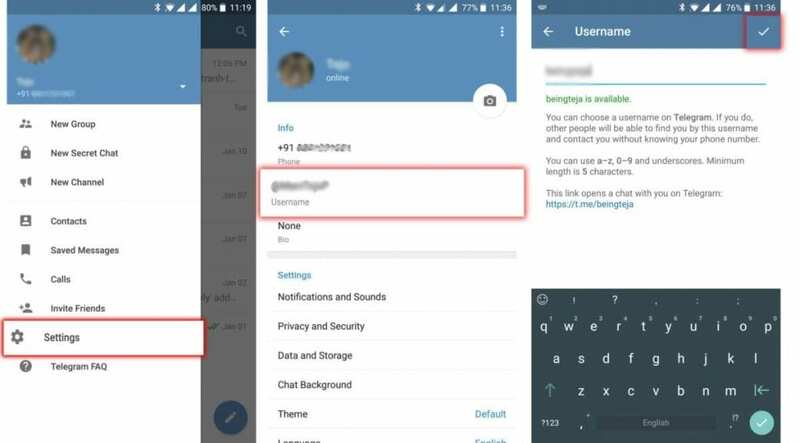 but in this article, I have shared some of the coolest tricks of Telegram messenger app which will definitely do justice to my statement. So before moving further first, we must be familiar with the reasons on why Telegram is better than whatAapp. This is probably the biggest reason to switch. Telegram offers cloud storage facility to its users which means no worry of storage. All your texts, images, audio and video media will be safe and secure in their cloud. Even you need not to worry about any backups, telegram will take care of this by itself. This is something for which I can ditch WhatsApp for. Username feature allows you to communicate with anyone on telegram even if you don’t have their contact number. It’s a very safe and handy feature as I guess for those people who really don’t want to share their contact details with anybody. This is something I wish WhatsApp can offer. Thankfully telegram allows you to compress any type of media file (images or videos ) you wish to send. The best part is that you can send any type of file using a telegram. There are limits such as WhatsApp offers. One can log in to multiple devices at the same time and still be able to receive messages on every connected device. So in my honest opinion, I find telegram much better option to opt for as it offers many useful features as compared with the world’s most leading messenger app WhatsApp. 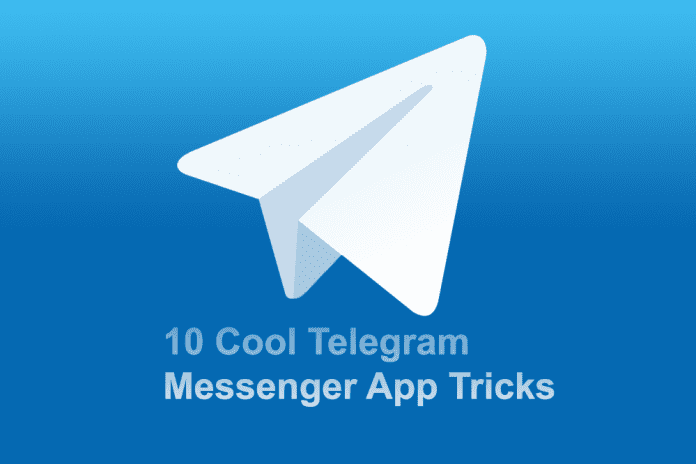 Now Here are some cool and useful tricks to be considered while using telegram messenger. 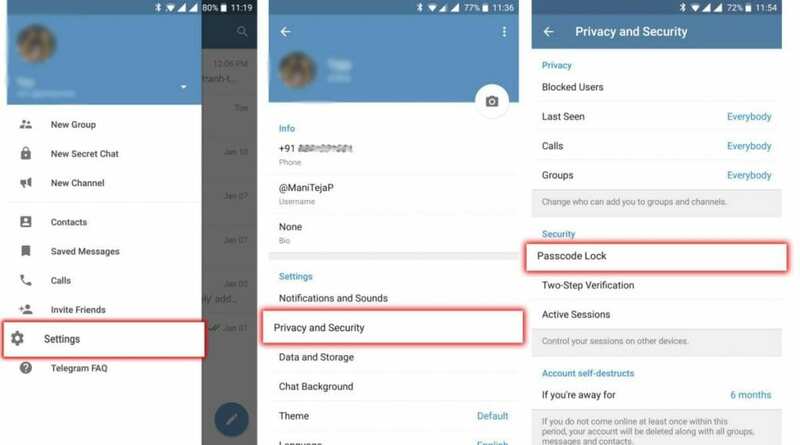 When a user is concerned about his privacy then this feature proves to be a boon for him. There are times when we are hanging out with our colleagues or friends and the sudden arrival of a text message from someone we are not willing to show will create anxiety in us. So telegram provides you with a feature to get rid of this worry. 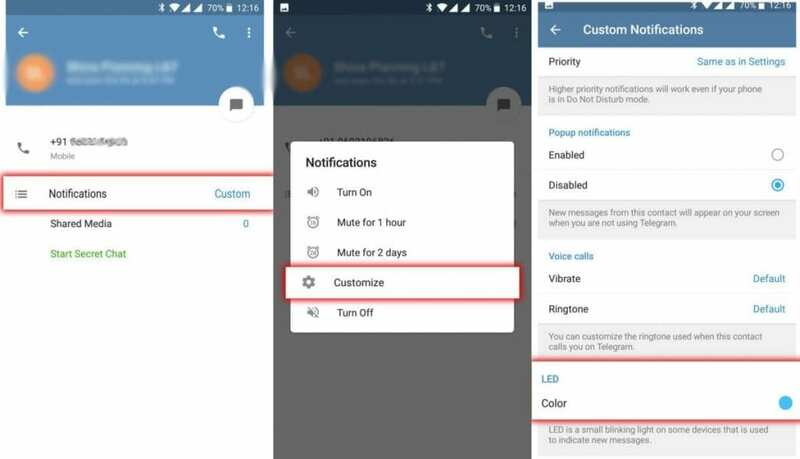 You simply need to turn on this feature by navigating to Settings -> Notification and Sounds -> turn off Message Preview. In this way, telegram is ensuring your full privacy and control. It’s very boring and tiring to find old messages you had in a chat. It may take time to scroll down and search for a particular message you are willing to see or respond. So telegram has a feature called search messages. By this feature, you can easily search for messages you want from long chats. In order to search for a message tap on any contact you want, then tap on a three-dotted button and select “Search”. Just after this, a keyboard will appear and there you have to mention the terms you want to search and press the search button. You will see a highlighted text which you wanted to search for. If you don’t want to share your contact details or real name then you can easily change your username. This allows the user to hide its real identity if he is not comfortable sharing it. In order to change the username go to Settings -> tap on Username -> Change and save. These days there are tons of phones available in the market which offers multiple colored notifications LED light. 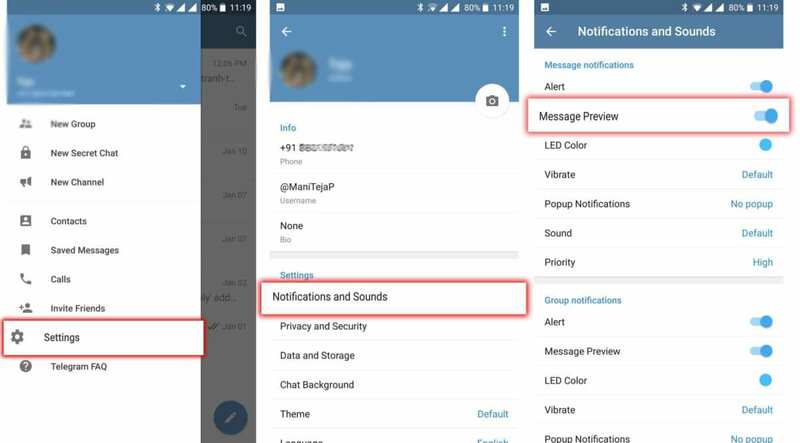 Moreover, you can select different notification light for different contacts. Yes, its possible but Android doesn’t allow the freedom of choosing custom notification colours. We separately have to install third-party apps to do that. But in telegram, you can go into contact’s info -> Notifications -> Customize and then select the colour you like. This feature is acceptable by some user and for some it’s irritating. Well, I personally like this feature as it comes to me very handy when I am in the middle of conversation. The main reason behind this is that it allows me to reply from home screen directly. To enable the pop-up notifications to feature we again need to visit Settings -> Notifications and Sounds -> Popup Notifications and select Always show a popup or Only when screen on or off. This will show pop-up even when the device is locked. Telegram lets you manage media more efficiently. In this app, you are allowed to send more than 1gb of a file easily. I find this as a big advantage of telegram over any other messenger app. 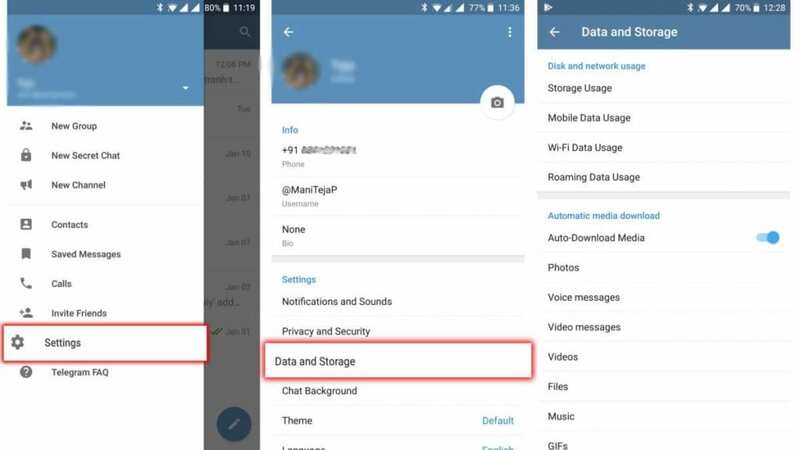 By default the automatic download is set to both wifi and mobile data so in order to change it go to settings -> Data and Storage -> Automatic media download. I consider this feature as a most useful feature in messaging apps as it lets you see when was the last time your knowns were online. It was good for parents as well in order to keep a check on their kids. Unlike WhatsApp where if a user disables last seen for everyone then he himself won’t be able to see last seen of others too. Here on the telegram, you can choose particular contacts for which you want to hide your last seen. To do that go to Settings -> Privacy and Security -> Last Seen. Now, set your last seen too add exceptions where you can set exceptions for contacts. There may be some scenario where you receive some private pictures from your friends which you don’t want anybody to see. So, in that case, you hide you telegram media files from gallery. Yes, it’s possible. Just go to Settings and disable -> “Save to Gallery”. By doing this you are preventing telegram media moving into your phone gallery. This feature is most loved feature as I wish any messenger app except telegram can offer. This is the biggest privacy feature I have ever seen on any app. 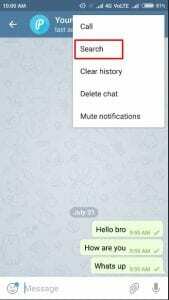 Telegram lets to lock your chat logs so that no one can read them. To set the lock, go to Settings -> Privacy and Security -> Passcode Lock and enable it, set the passcode for it. This feature is very popular in snapchat. It simply destroys every message you send. This initially keeps your chat private and secure. 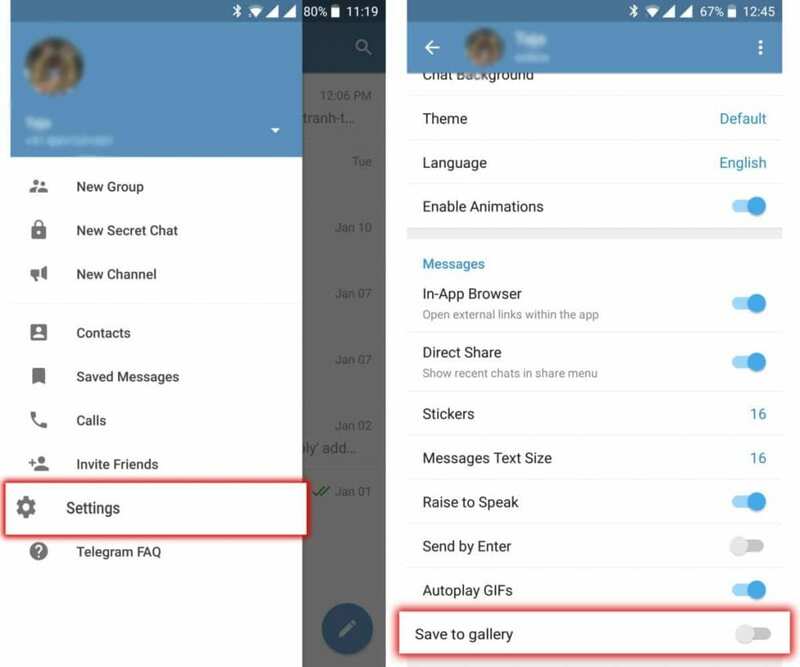 And now you can also enjoy this feature on telegram by simply following these steps. On the right side of the app, you will see a Three-dot menu button, tap it and select “Set self-destruct timer”. Set that timer to 1 second. So these were some of the cool tricks you can apply to get most out of telegram experience.